Rodney McAree stands as first-choice candidate for the position of Coleraine manager following the continuation of talks between Bannsiders officials and the Dungannon Swifts boss. McAree emerged this week as the leading target of the Coleraine club to replace Oran Kearney and it is understood discussions have been positive to date. Kearney’s departure to take up a post at St Mirren in Scotland left The Showgrounds club absent a figure who relished a responsibility beyond the simple remit of first-team manager. 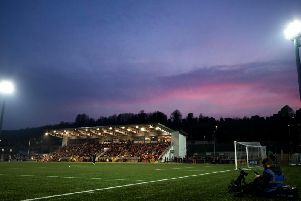 That influence across all areas of Coleraine operations proved instrumental in the rise of the club to compete for the top Irish League prizes. McAree’s reputation of boasting an outlook similar to that of Kearney marks the current Swifts boss as an ideal option to help maintain the momentum. McAree was linked to the Glentoran job last season but opted to sign a fresh deal with the Swifts. However, it appears the lure of the Coleraine project could signal the departure of McAree from his hometown club.